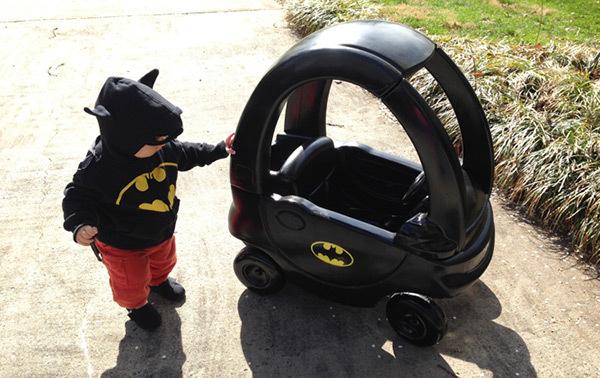 Holy Batman, a Cozy Coupe gets a Batmobile makeover! Superheroes always have the coolest cars, and pretend superheroes are no exception to this rule. We’ve all seen the awesome adult sized motorised Cozy Coupe replica, and then I wowed you with the sugary sweet Minnie Mouse Cozy Coupe makeover, but now, now we’re getting serious. 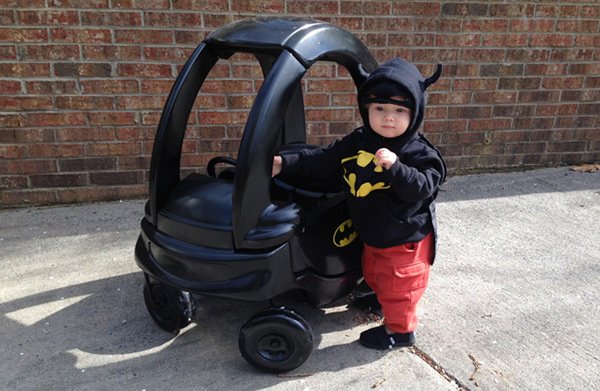 It’s the Cozy Coupe version of the nocturnal, crime fighting superhero himself, Batman’s Batmobile. Let me be clear, such a Cozy Coupe transformation isn’t too difficult to perform, as seen here in this step-by-step tutorial. All it takes is a really good scrub of the toy, a coat of paint and a Batman decal and you too can pass yourself off as a professional Cozy Coupe detailer. Not to mention that while you bask in your DIY smugness, your tot is bound to have hours of fun cruising the verandah looking for fictional crime to fight and innocent people, toys and pets to defend!